The YWCA indoor pool hosts a comprehensive Aquatics Program with activities for all ages, abilities, and interests. Our solar-heated pool is 75′ x 25′ (25 yards long and four lanes wide) with an average water temperature of 86° F. The pool is ADA compliant with a pool lift and extra wide stairs with ergonomic railing, making the pool fully accessible to people of all physical abilities. As a YWCA Fitness Center Member, you have full access to our pool facility and water exercise classes. *For information about our upcoming Red Cross Water Safety Instructor Course go HERE. 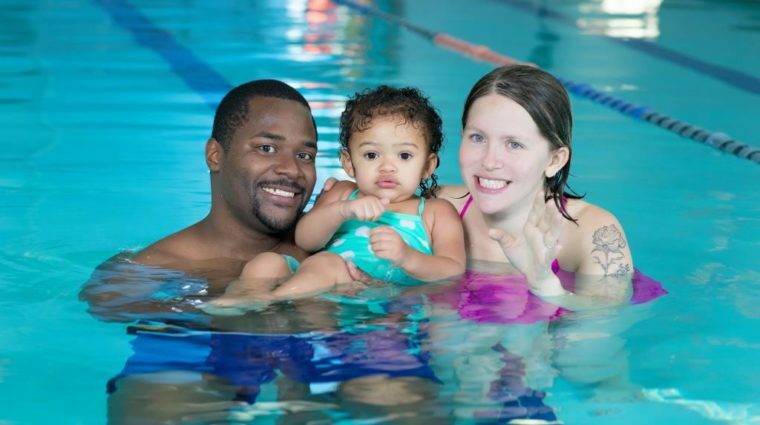 Our learn-to-swim program offers year round swimming lessons for all ages and skill levels. Learn more about our aquatic class options for all fitness and swim levels. Water Exercise Schedule includes classes, lap swim, open swim and family swim times. Full Pool Schedule includes swim lesson times. 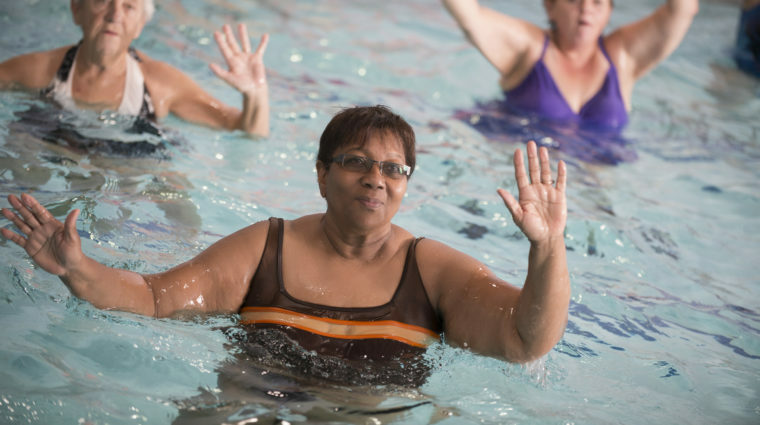 More than health and fitness: YWCA Aquatics programming is deeply rooted in racial justice. In the 1960’s there were two branches of the YWCA in Asheville: a white branch and a black branch, and swim lessons were one of the first programs to be integrated. Still today, drowning is the leading cause of unintentional death of school-age children with African American children being SIX TIMES more likely to drown than white children of the same age. 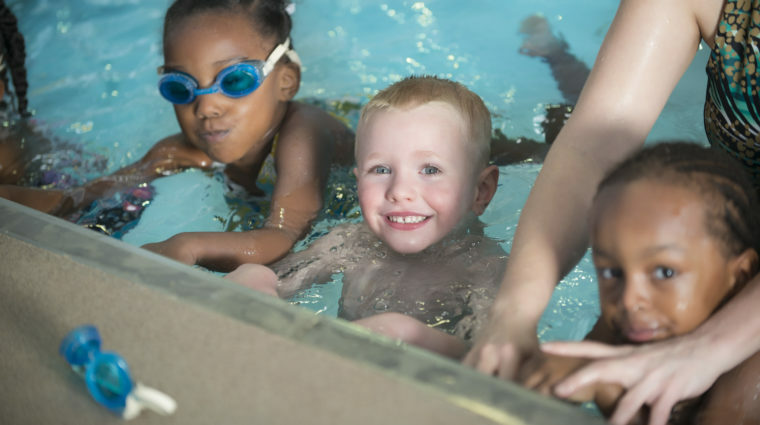 By providing swim lesson scholarships, lessons for children in our Early Learning Program, and by partnering with schools and community programs, YWCA Aquatics is taking aim at this disparity in our community. Everyone who enters the YWCA must sign or scan in at the front desk. Women’s locker rooms are located on the ground floor, and Men’s locker rooms are located upstairs. The YWCA has two gender-neutral changing rooms, one on each floor. One upstairs across from the Fitness Studio includes a bathroom stall. One downstairs on the pool deck includes a bathroom stall, shower stall, and lockers. Adults may accompany children 6 and under into locker rooms. As part of the YWCA’s continuing commitment to equality and inclusion, there is no dress code requirement for the pool. Swimmers are welcome to wear whatever keeps them comfortable with only one exception: no jeans. All of our Aquatics staff are certified lifeguards, and there is always a lifeguard on duty. The YWCA follows the National Lightning Safety Institute guidelines regarding thunder and lightning. When either is present, the pool and pool deck must be cleared for 20 minutes after each instance. Stay connected: Get notifications for real-time facility closure updates on the go! Pool party rentals include 1 hour in the pool and 1 hour in the Multipurpose Room. Your party has the pool to itself with a lifeguard on duty. 2-hour pool-time-only parties are not available. Pool party rentals are available for up to 30 people, including all adults and children. If participants exceed 25, then an additional lifeguard is required at the fee of $20.00. We require 1-week notice of the need for an additional lifeguard. If no arrangements have been made and more than 30 persons show up, the guard will need to control the number of people in the pool by having swimmers take turns. YWCA’s swimmies and balls may be used. You may bring your own pool equipment. The diving board, slide, mermaid fins, and blocks are not available for use during parties. Please be on time as these times have been reserved for you and cannot be adjusted due to tardiness. We are a smoke-free campus so please refrain from smoking in the building or on the YW campus at any time. This includes all participants of your party. The YWCA is also a fragrance-free environment. Thank you for not wearing any cologne/perfume, scented aftershave, perfumed hand lotion, hair products, etc. 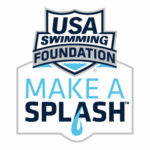 YWCA Aquatics is proudly supported in part by a Make a Splash Grant from the US Swimming Foundation.